2. High stability and perfect fit design：The extra large leg pad and non-slip rubber threading provides large amount of connect area to the thigh. 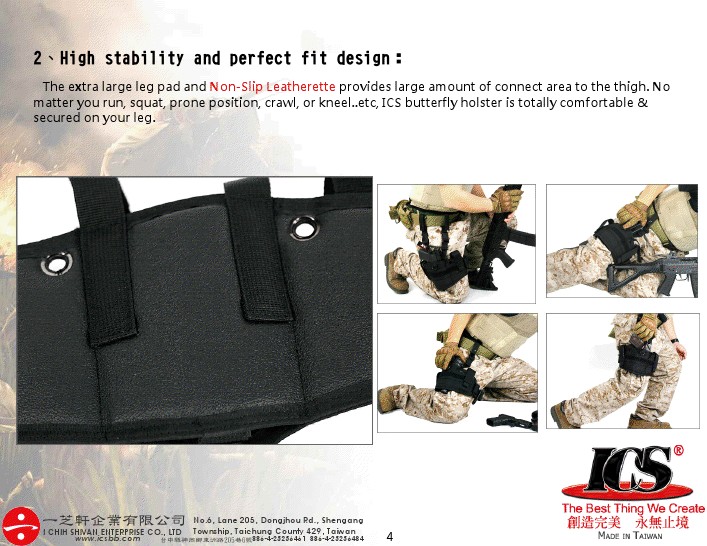 No matter you run, squat, prone position, crawl, or kneel..etc, ICS butterfly holster is totally comfortable & secured on your leg. 3. 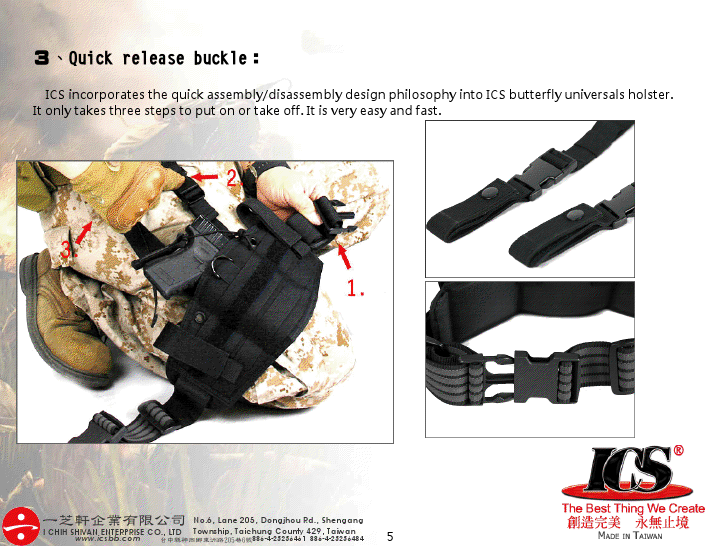 Quick release buckle：ICS incorporates the quick assembly/disassembly design philosophy into ICS butterfly universals holster. It only takes three steps to put on or take off. It is very easy and fast. 4. 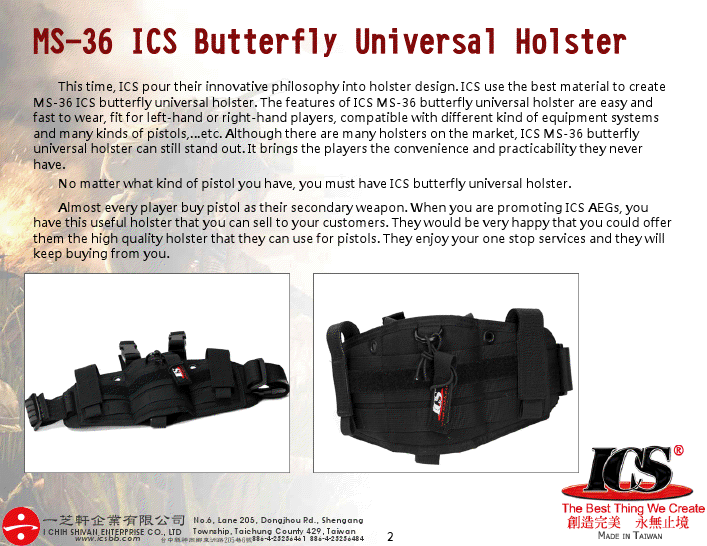 Left-hand & right hand compatibility：ICS butterfly universal holster is designed for left-hand & right-hand players. 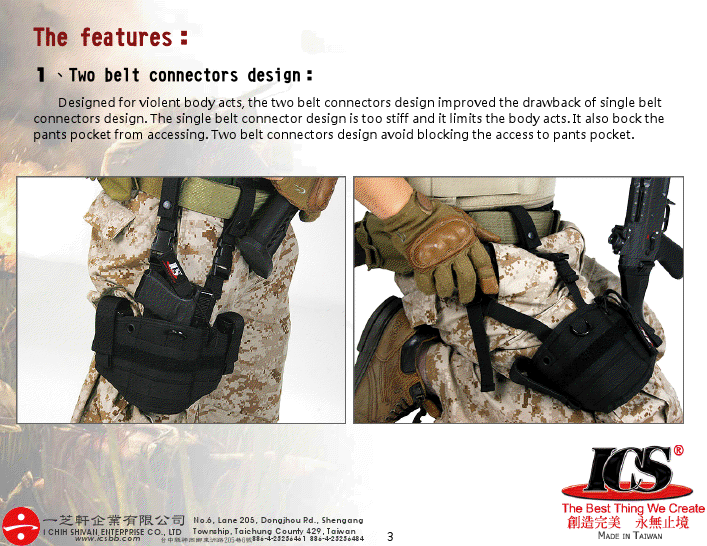 The thigh fastener design let both left-hand & right-hand players put on the holster tightly. 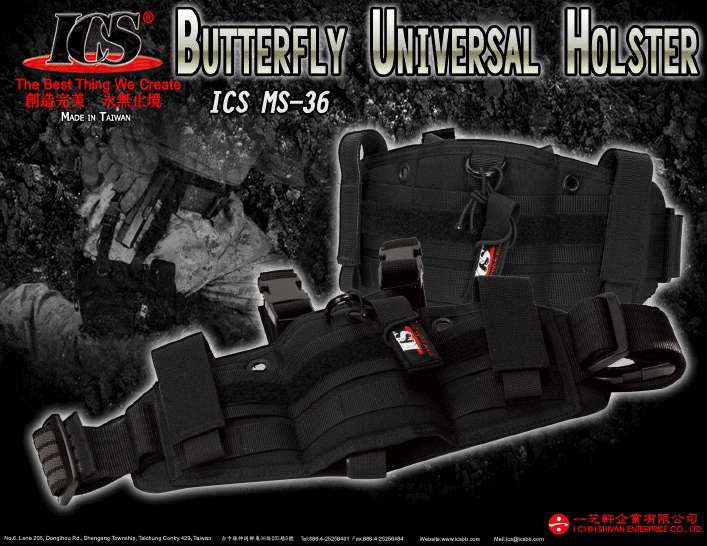 No matter you run, squat, prone position, crawl, or kneel..etc, ICS butterfly holster is totally comfortable & secured on your leg. 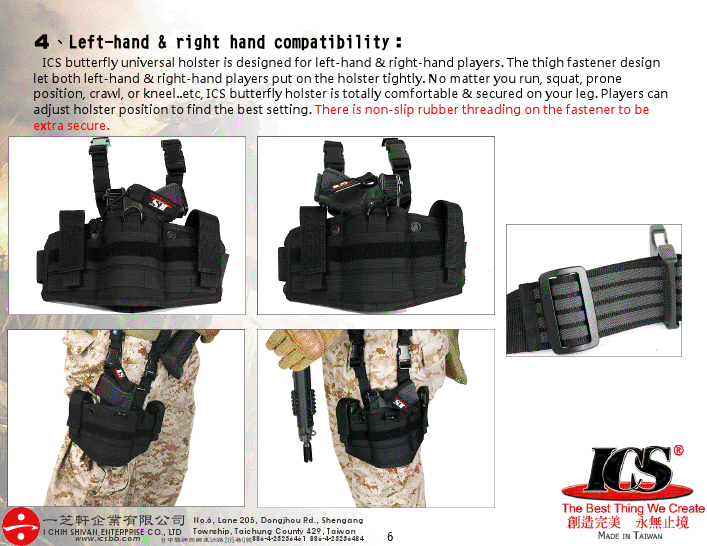 Players can adjust holster position to find the best setting. 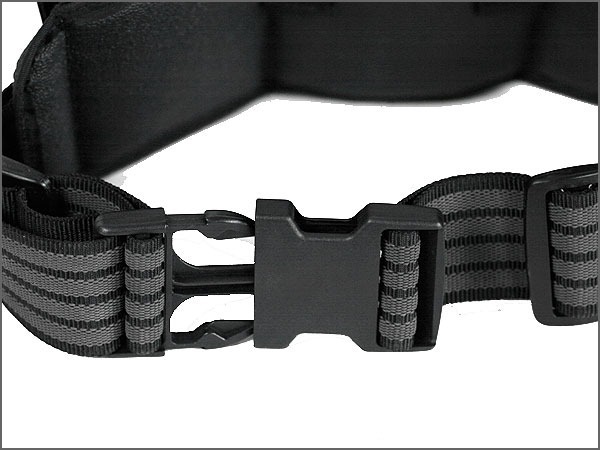 There is non-slip rubber threading on the fastener to be extra secure. 5. 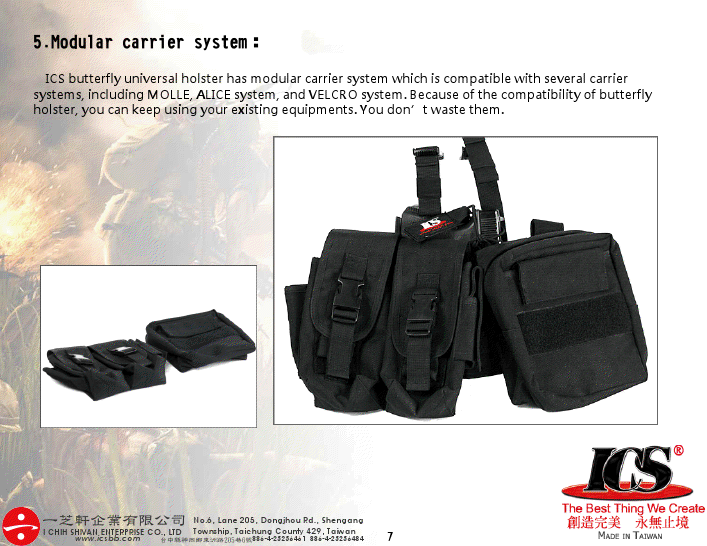 Modular carrier system：ICS butterfly universal holster has modular carrier system which is compatible with several carrier systems, including MOLLE, ALICE system, and VELCRO system. 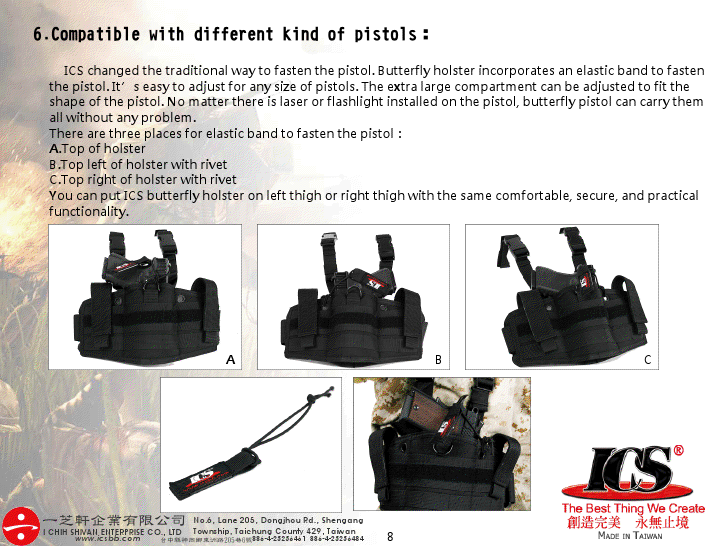 Because of the compatibility of butterfly holster, you can keep using your existing equipments. You don’t waste them. 6. 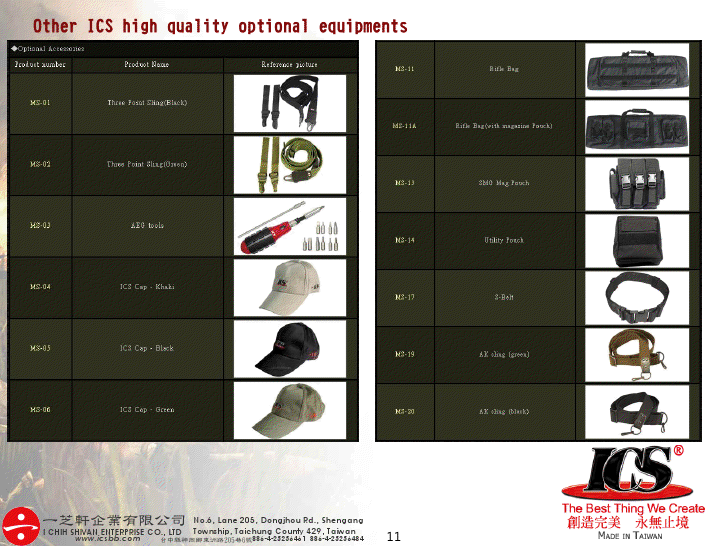 Compatible with different kind of pistols：ICS changed the traditional way to fasten the pistol. 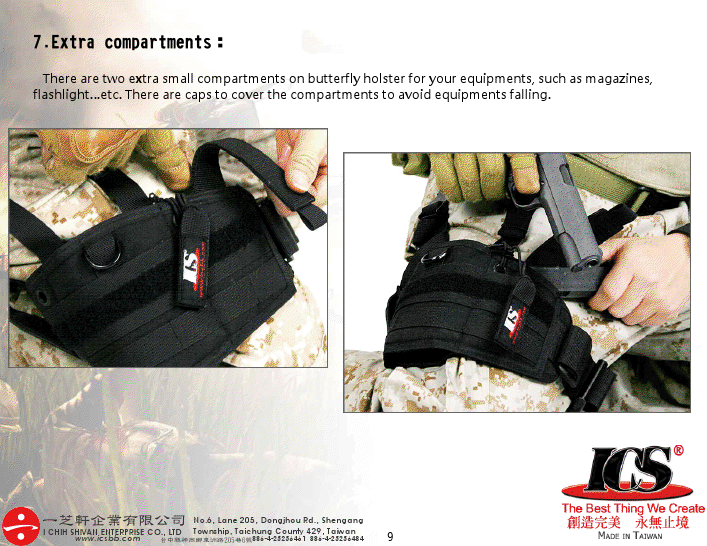 Butterfly holster incorporates an elastic band to fasten the pistol. It’s easy to adjust for any size of pistols. 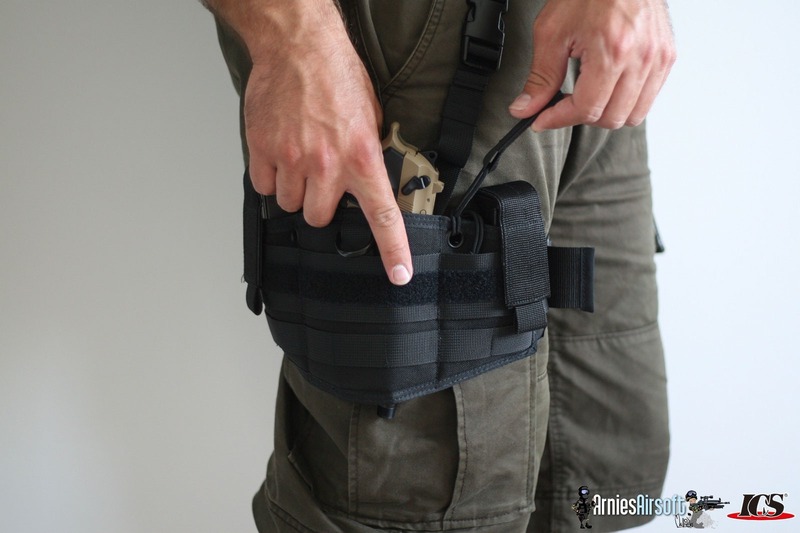 The extra large compartment can be adjusted to fit the shape of the pistol. 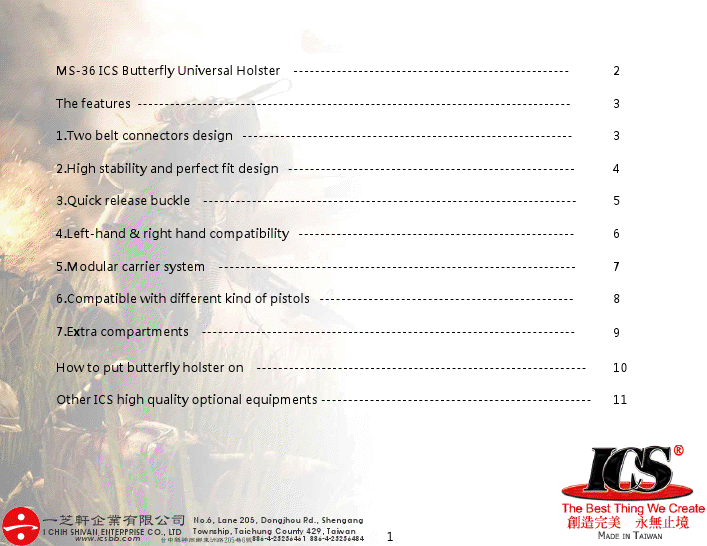 No matter there is laser or flashlight installed on the pistol, butterfly pistol can carry them all without any problem. 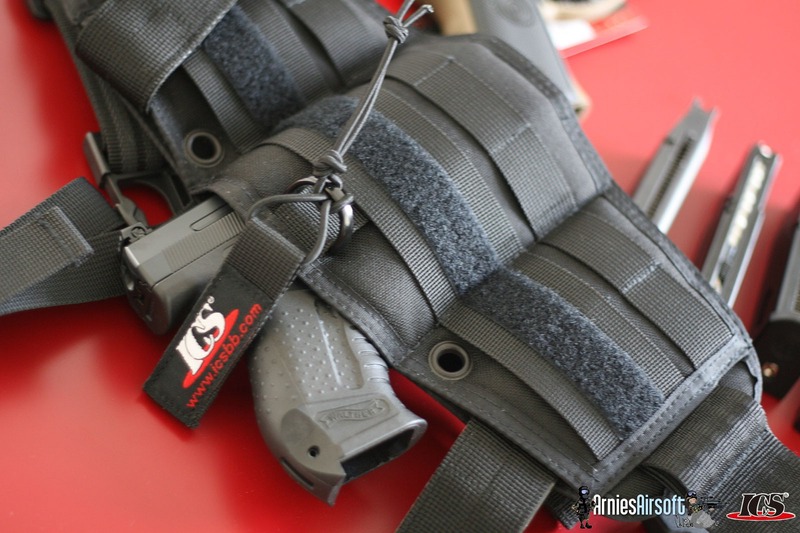 The new Butterfly Holster from ICS is a soft drop leg holster, designed to be ambidextrous and to hold a pistol and two magazines with the minimal of fuss. 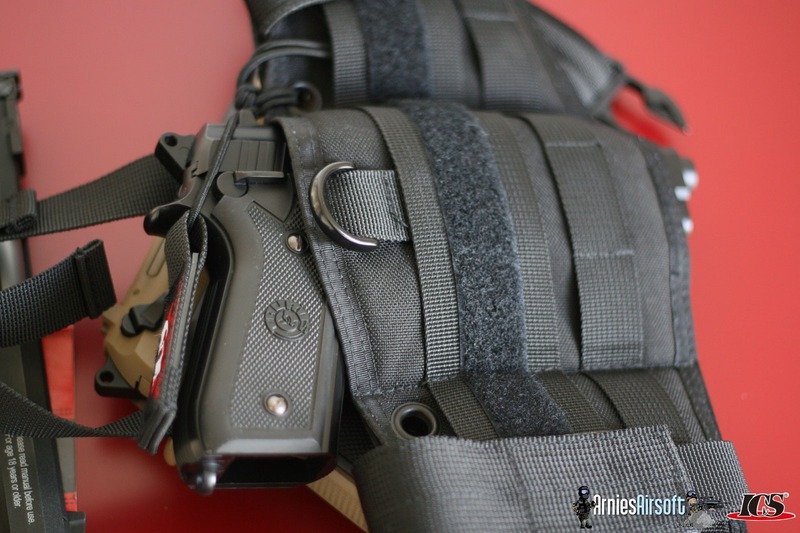 Unlike rigid designs such as those available from BlackHawk, Kydex and Fobus the soft shell allows the holster to fit a variety of pistol shapes and designs. The modular style also allows the owner to customise their kit around to fit their mood or latest purchase. 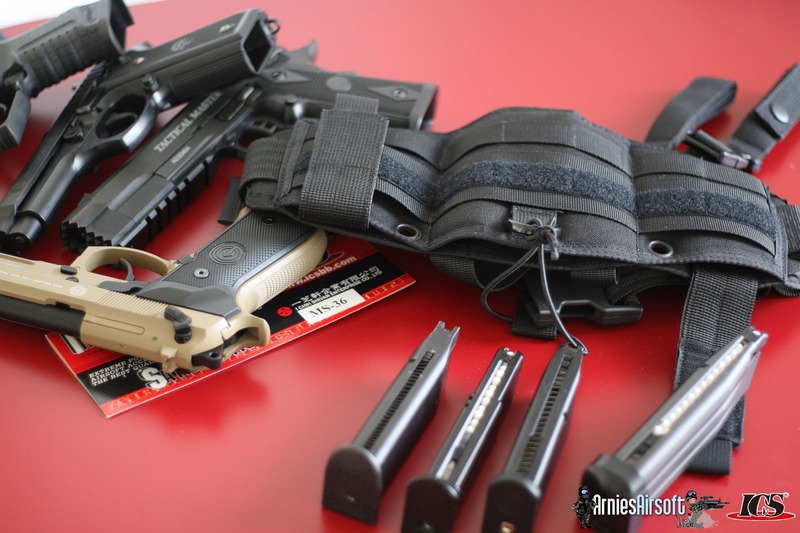 Set up: You don’t get any instructions with the holster it simply comes in cardboard topped clear plastic bag. 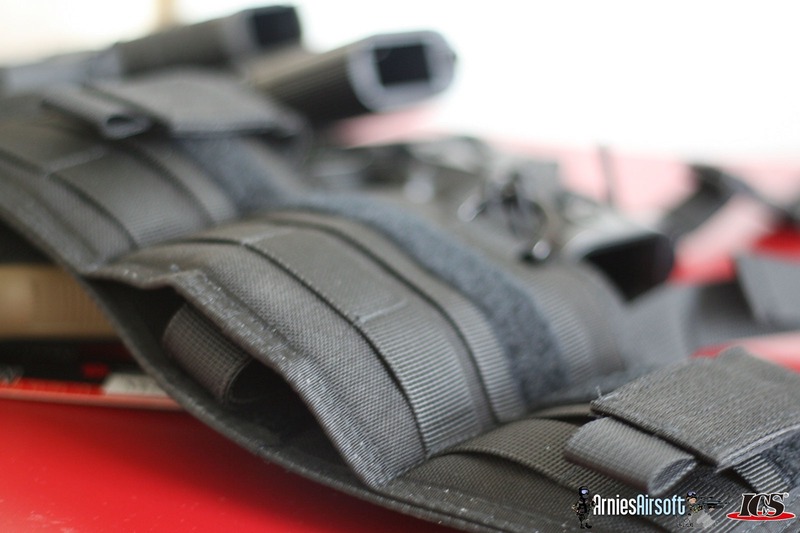 When you pull the holster from the bag you’ll find the thigh strap and leg straps already fitted. It’s quite honestly quite obvious how to get things going and where the pistol and spare magazines go. 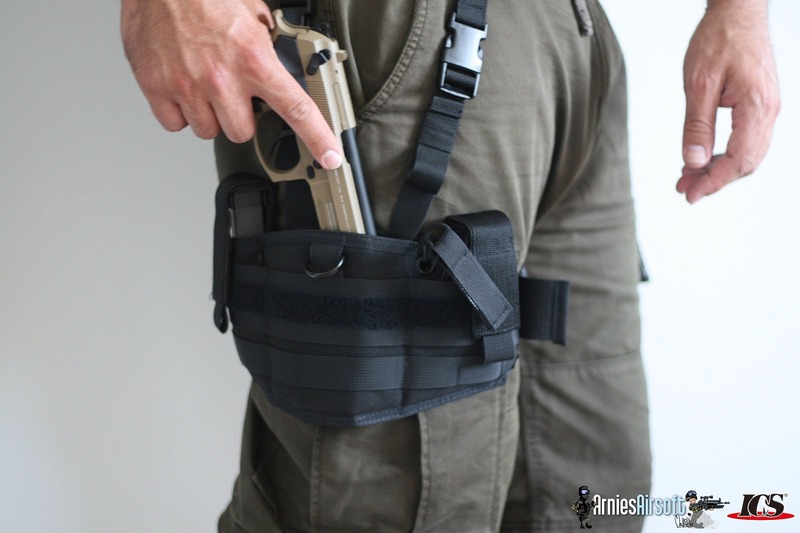 What may stump some users briefly is how the holster works. Inside the two part sleeve that comprises the area for the pistol you’ll find a double sided rigid hook and loop tongue. 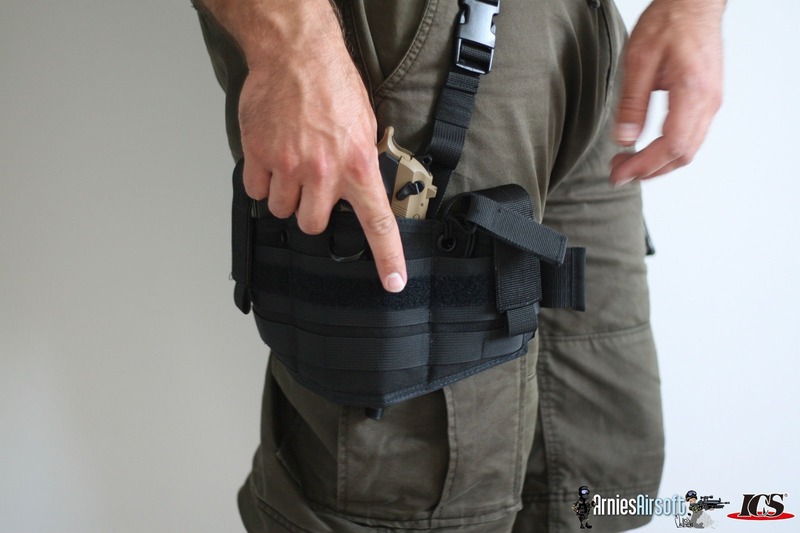 This piece is to form the pistol pouch to the shape and size of your pistol. I used it to set the depth for the trigger guard and thus keep the pistol at the desired length/depth in the holster. 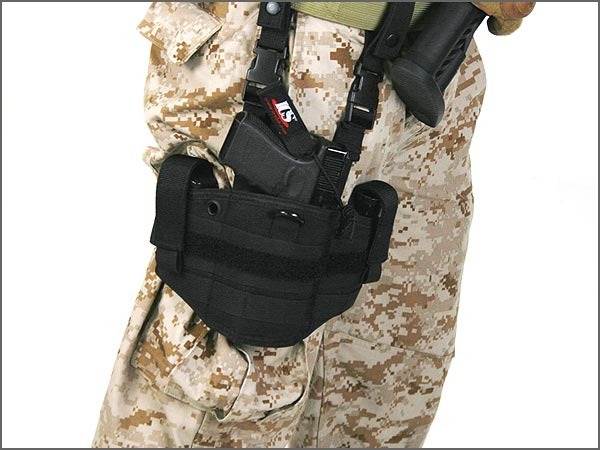 You’ll also find an elastic lanyard tied to the middle d-ring on the holster. You’ll note that there’s also two metal eye rings on either side of the holster. 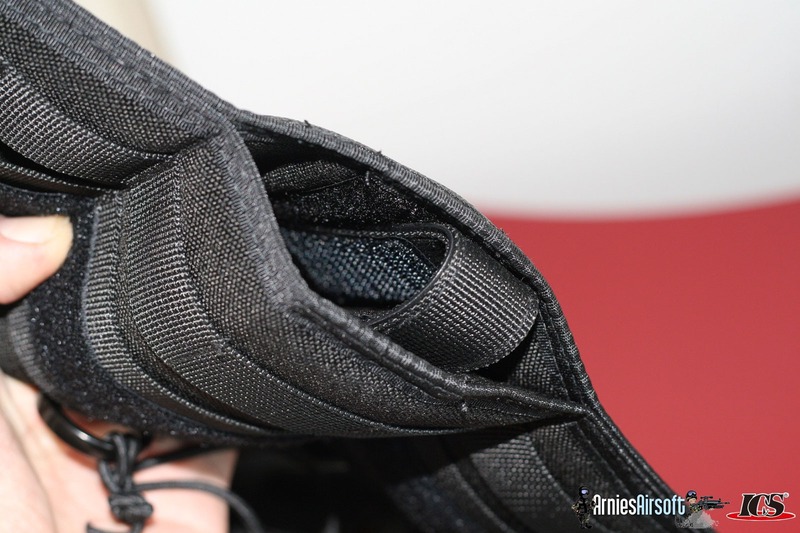 Depending on your setup you can run the elastic loop from the ring or one of the two eyelets. 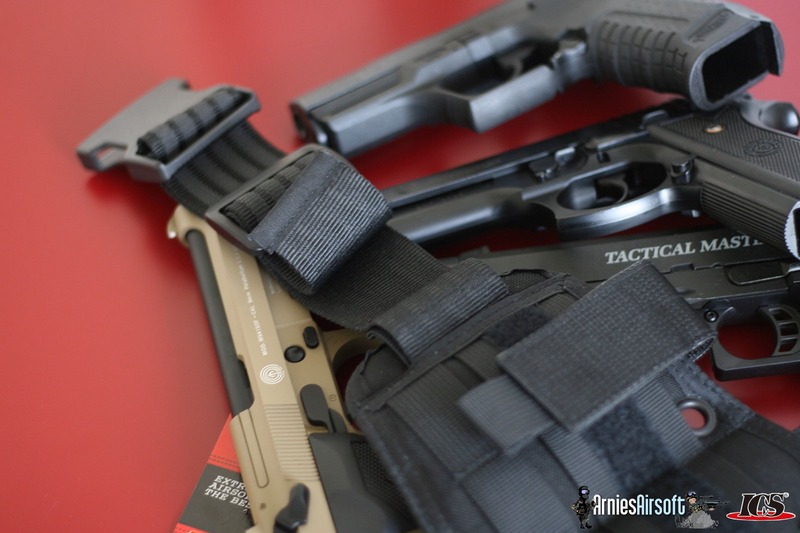 I preferred to run the elastic from the front of the pistol over the grip, but if you wish you could run the elastic retention over the rear grip of the pistol. The aim of the game is to stop the pistol jumping off your leg when you are running, so set things up as you desire. 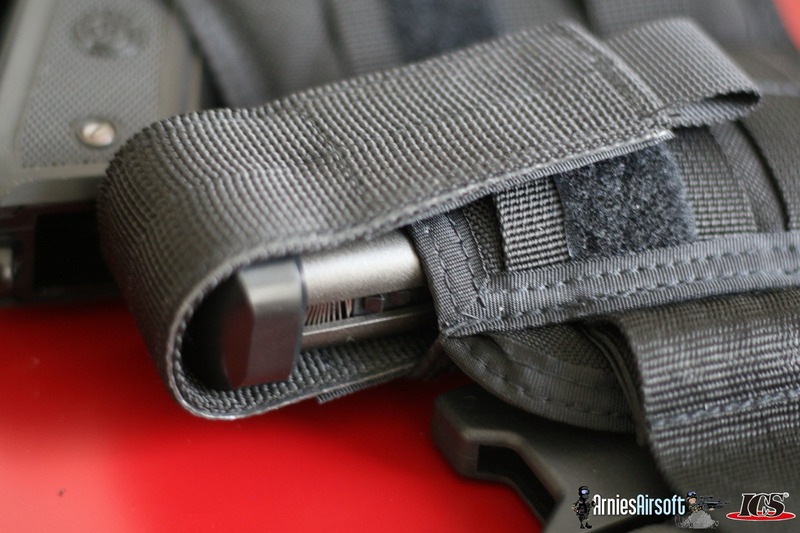 Design: Keeping the holster up you’ll find two straps on quick release clips. 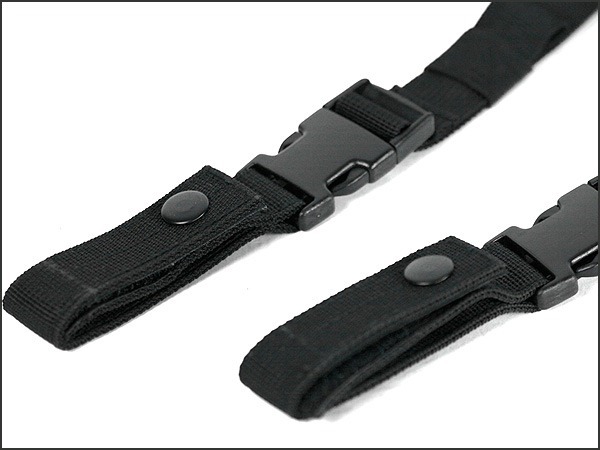 These loops are made from decent quality nylon that’s double stitched with a velcro and button closure. 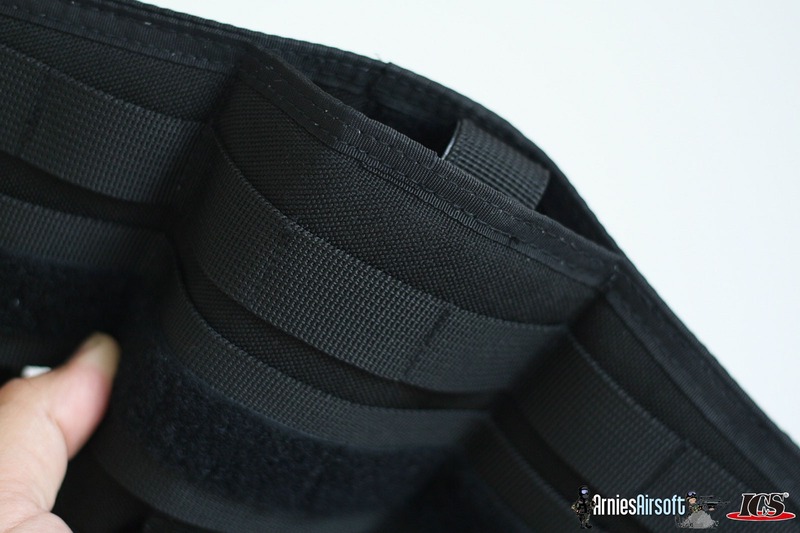 The straps don’t run through the buckles freely so won’t loosen when you wear it and there’s an elastic strap around each strap to take up the slack to keep things tidy. 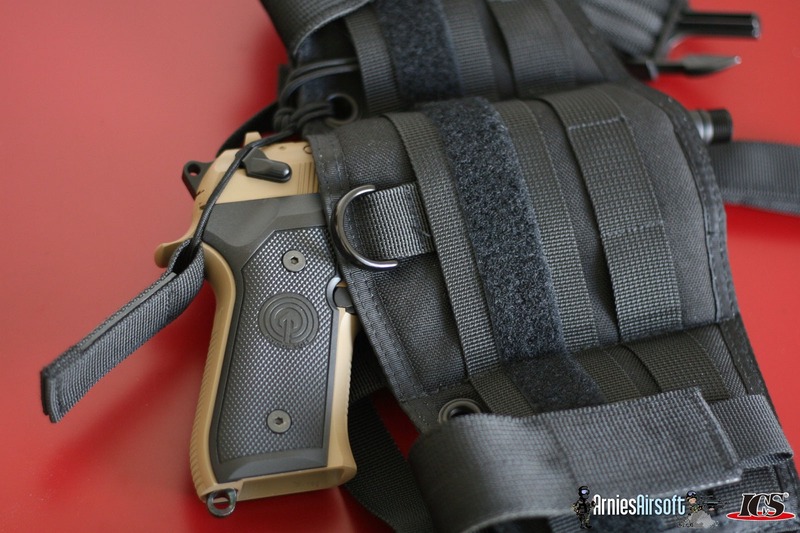 On the outside of the holster you’ll find a D loop. 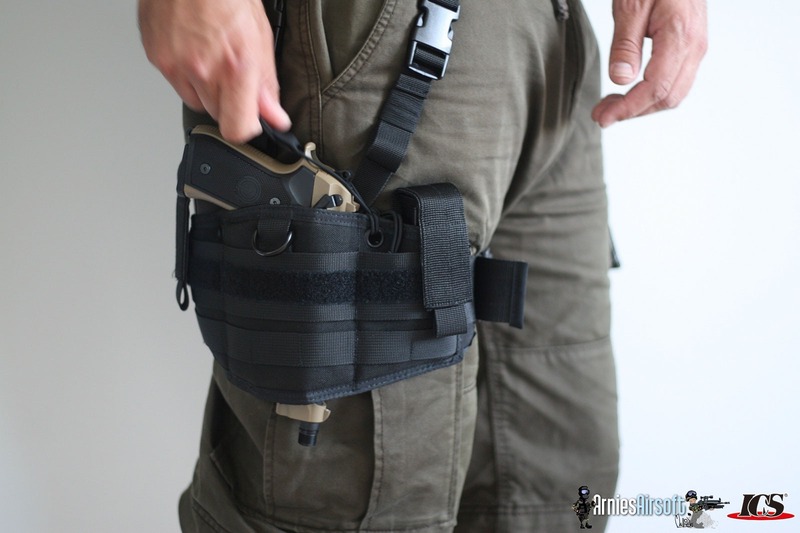 I found this most useful for tugging the side of the holster away from my leg to secure the pistol back in the holster although I’m sure you could use it to secure lanyards and accessories to. 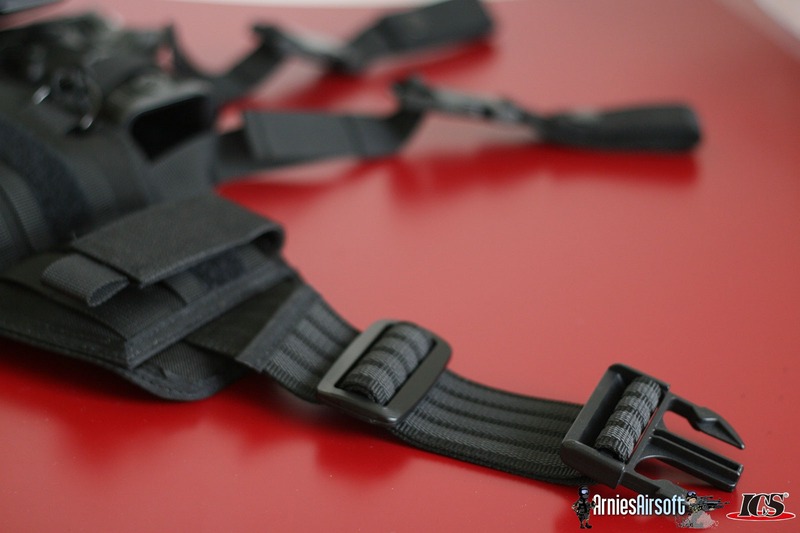 The leg strap itself is made from non-slip material and much like the supporting straps they feature decent buckles and don’t slip like cheaper builds can. 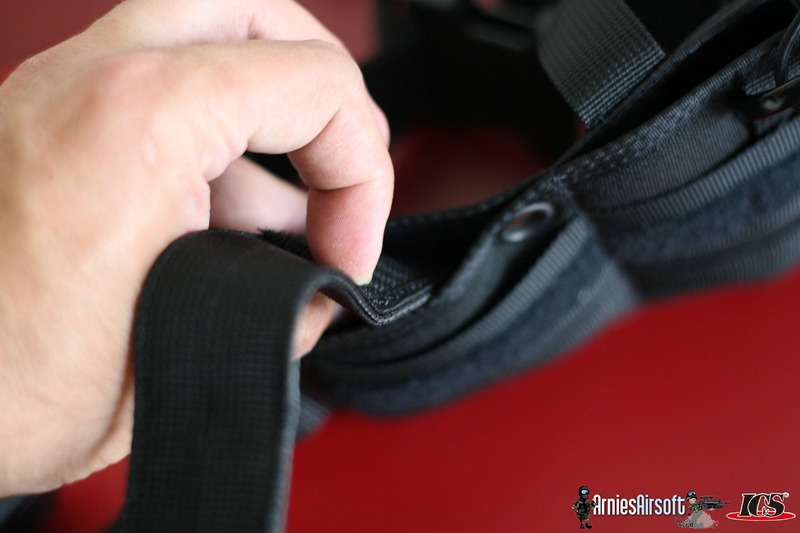 Inside the holster is a velcro piece you can use to shape your holster. You can either keep the sides apart, stick them together or use it to stop your pistol falling in too deep. If you use a lamp/laser unit on your pistol you might remove it all together to allow a complete fit for your pistol. 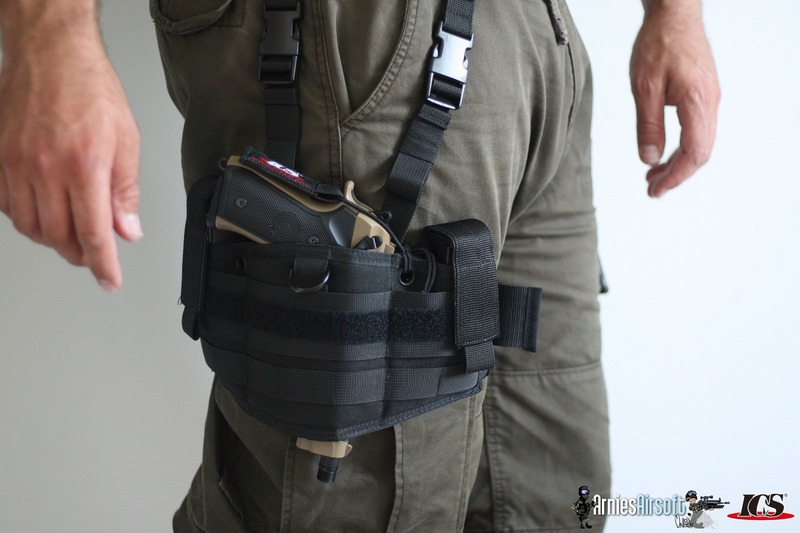 it’s really all down to how you’d like to customise the holster. The AE Tactical Master is a beast of a pistol and about the largest pistol you’d reasonably want to holster with a double stack magazine and extended CQB frame/barrel. Obviously the KWC Taurus a cheap and cheerful pistol, the SOCOMGEAR is a full weight Beretta copy and the Walther is a small frame pistol. So how well does the almighty .45 fit? 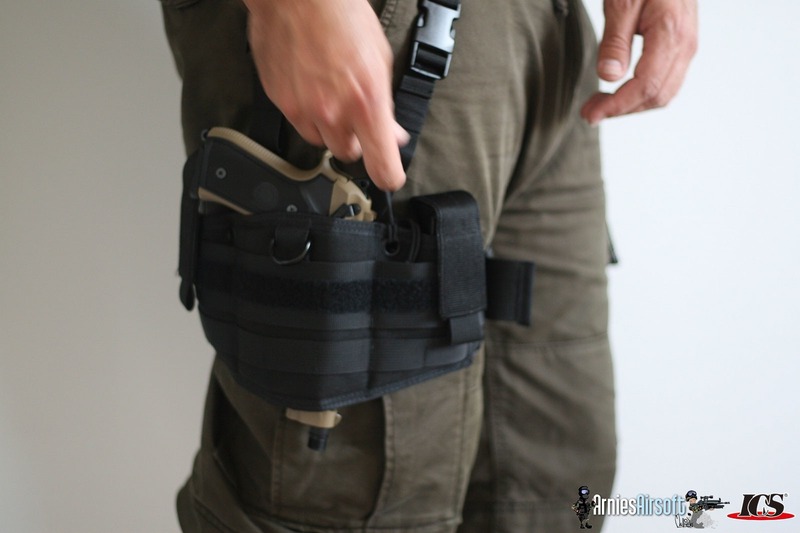 I quickly slipped mine into the holster and then held it upside down trying to push the pistol out of the holster from the muzzle downwards. 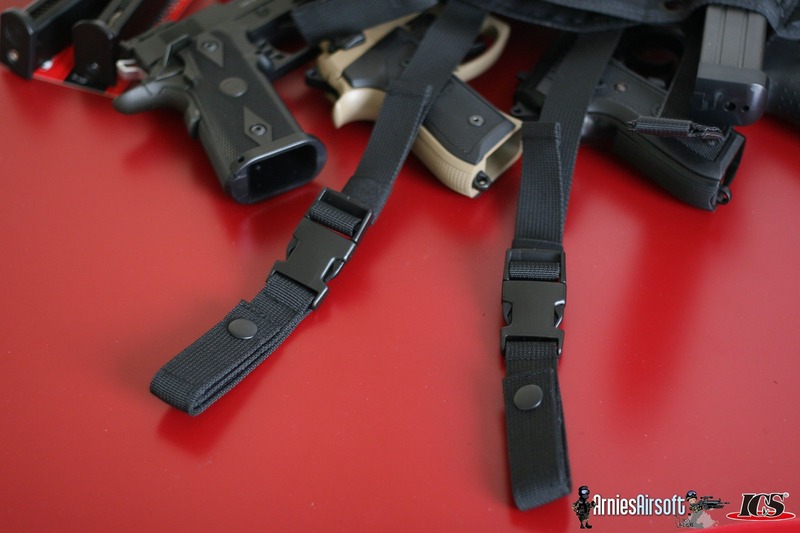 The elastic lanyard easily keeps the pistol in check. 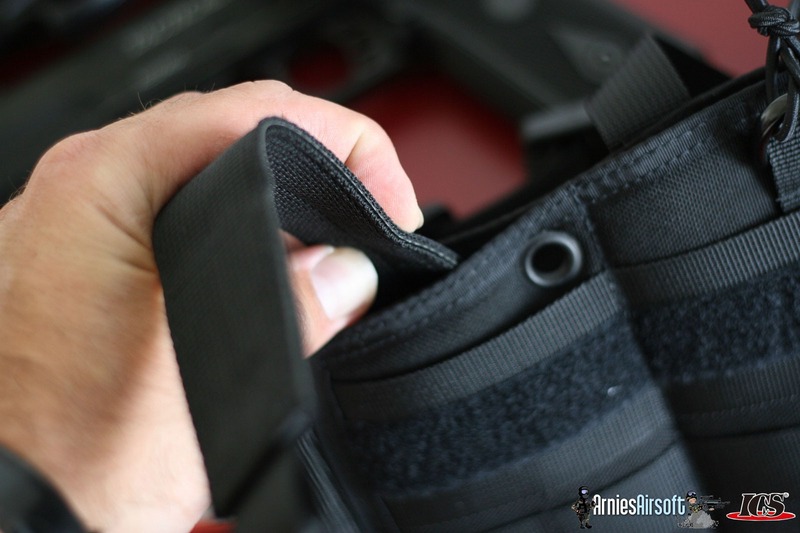 Should you wish to have an even more secure fit you can always loop the elastic from the rearwards eyehole and over and around the pistol grip itself. It really is a game of balancing security against the ability to draw the pistol quickly. 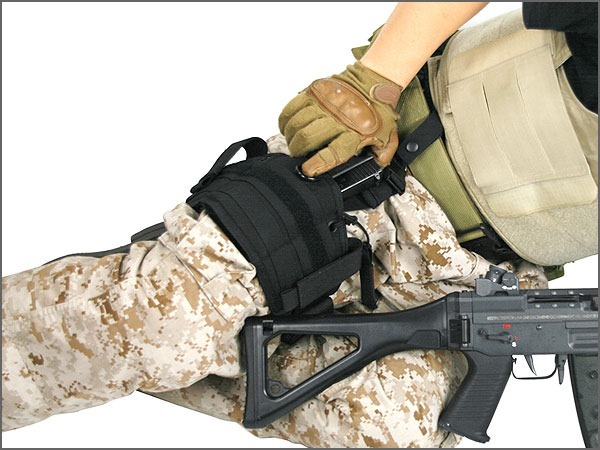 One of my concerns with the WE double stack clones is that the magazine release catch protrudes and most thigh holsters have a nasty habit of catching the release catch and deploying your magazine into the corner of a room at a very inopportune time. What about magazines? 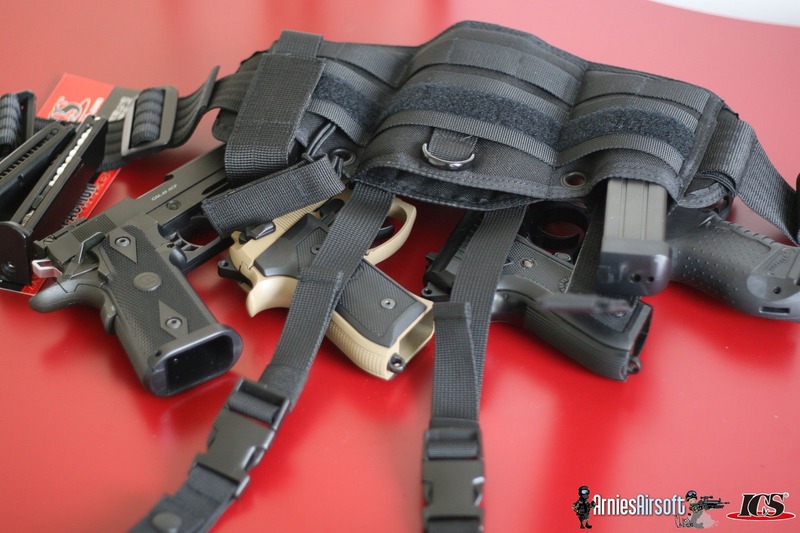 The varied selection of pistols gives us a decent variation of sizes to try. 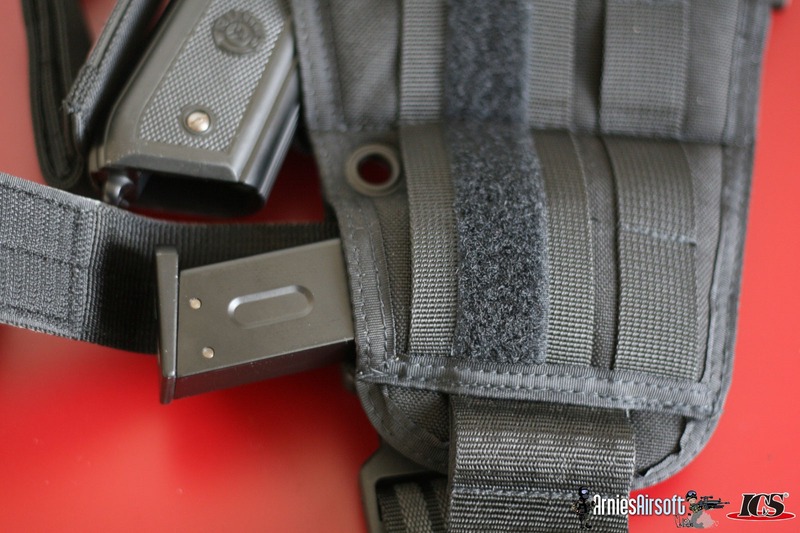 You can forget about extended magazines like the WE CO2 magazines here, whilst they will fit the retention strap is not long enough to hold a magazine that long. You should find that all standard magazines should fit without issue. 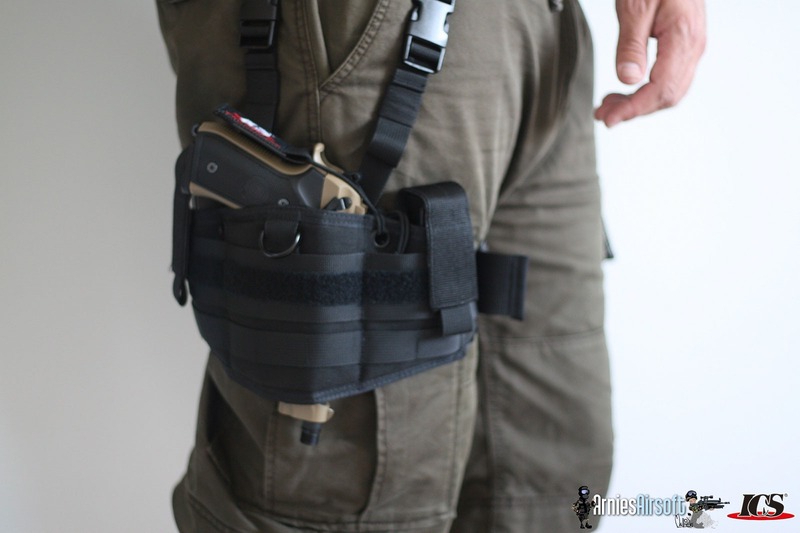 There’s one magazine pouch either side of the holster itself. Inside this you’ll find a velcro flap. You can simply detach this and vary the length to fit your own magazines. As you might expect, a double stack .45 style magazine is about as large as you can fit here. I found the WE magazines were no trouble at all when inserted. 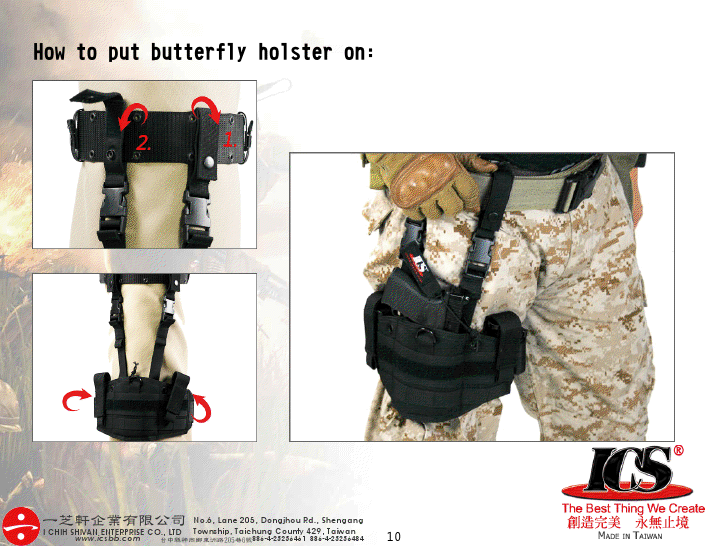 Wearing: Putting the Butterfly on is nice and easy and much like any other drop leg holster. 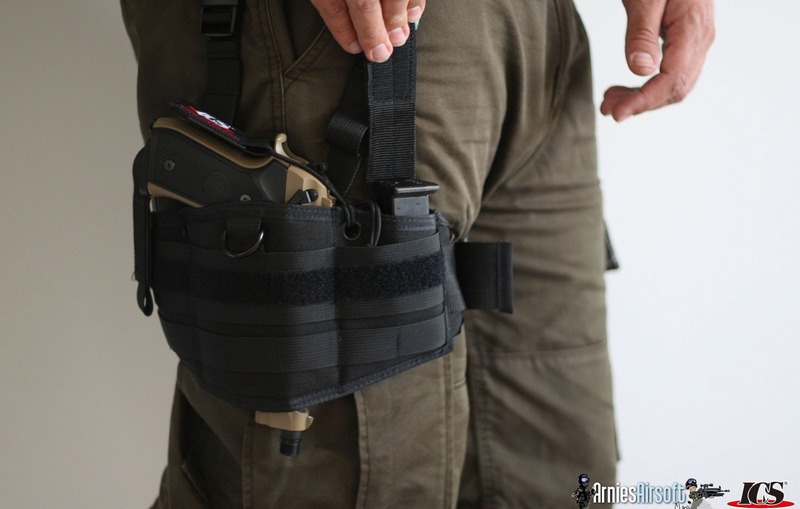 Simply place the holster on your thigh where you want it, tighten up the thigh strap and then attach the two belt loops to your belt. 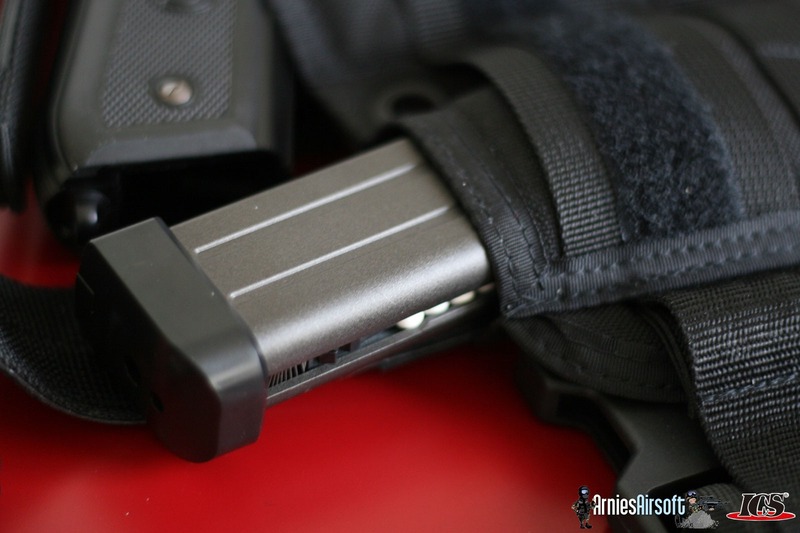 I tend to take the belt straps to their widest angle to allow access to pockets and to aid in the stability of the holster when moving. 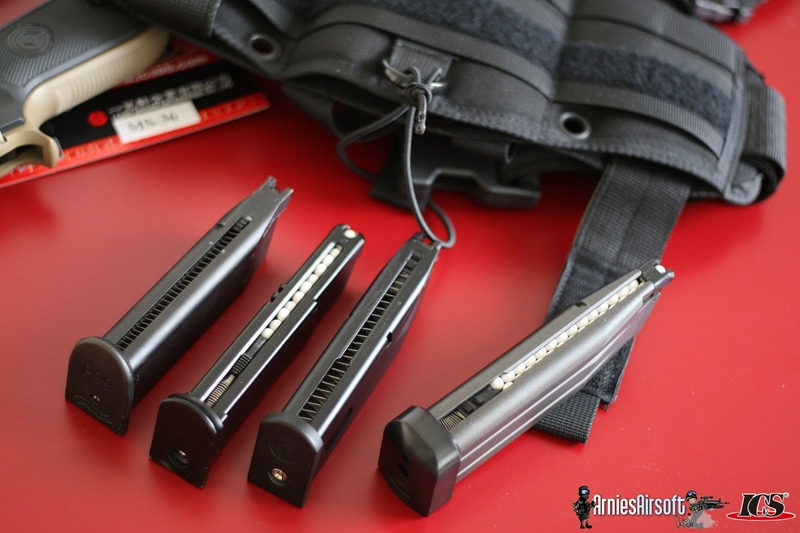 I’d recommend ensuring that the magazines themselves are easily accessible and the pistol is set to a comfortable height, you want your hand to be able to get to the pistol without stooping downwards. 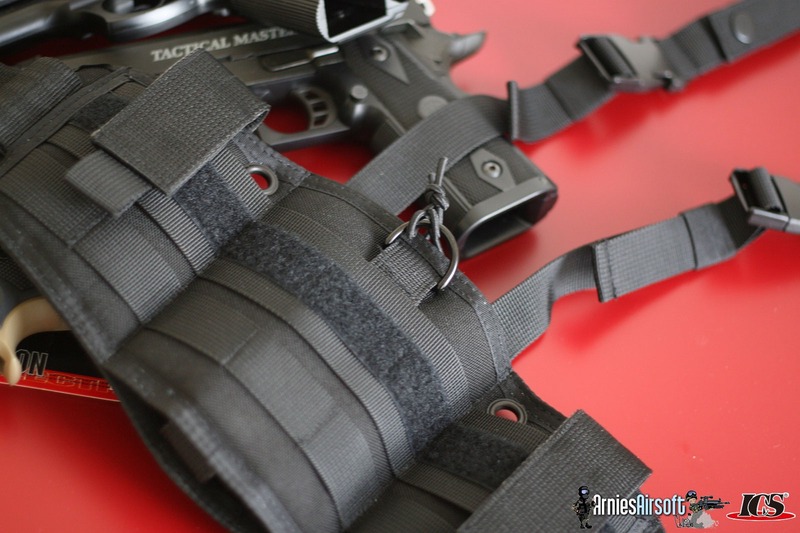 To draw the pistol in this setup you can simply grab the pistol and with your weak hand remove the retention loop. Your personal style may vary hear so each to their own. Holstering the pistol I’d just recommend keeping your thumb over the back of the slide. There’s two issues here, first airsoft guns simply don’t have the recoil springs of their real counterparts so the slide will tend to fall backwards easily leading to potential jams and double feeds when you next pull the pistol out if you let the slide backwards. 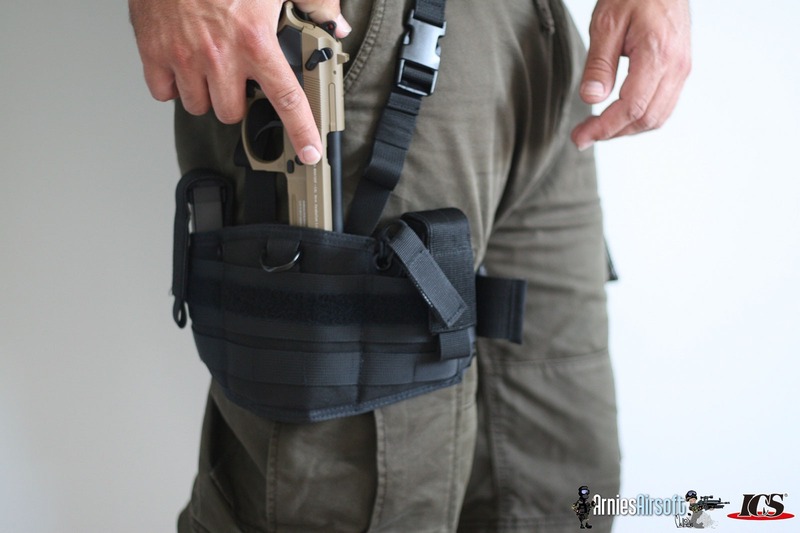 Secondly this holster is non-formed and made of fabric so there may be a some resistance to sliding the pistol in especially if you’ve pulled the straps tight or have flexed your leg – as you pull the holster tight horizontally it will pull the holster aperture sides together. So in conclusion, here’s the good and the bad. 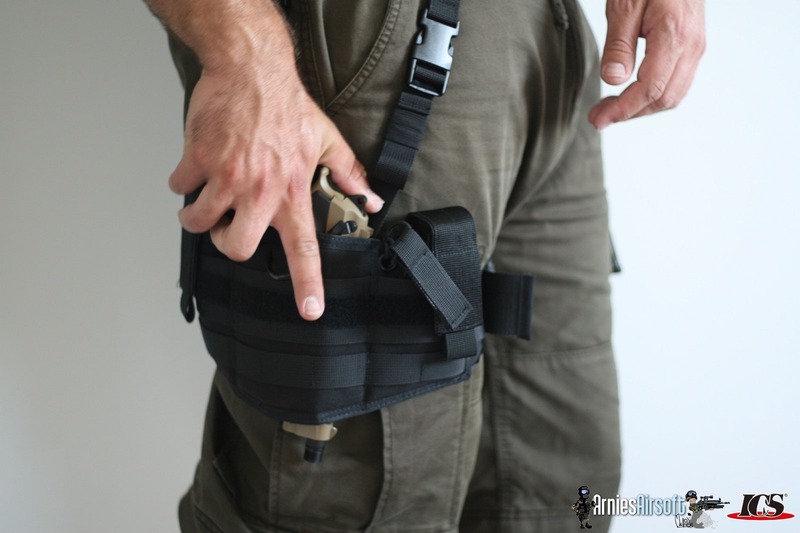 One holster fits all. Whatever pistol you have or decide to change to in the future this should cater for you. It holds pistol and two magazines securely (no more smashed magazines). 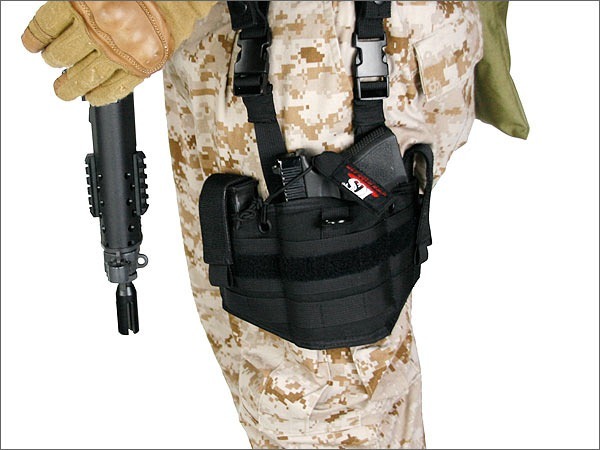 Room to handle lamp and laser units when holstered. 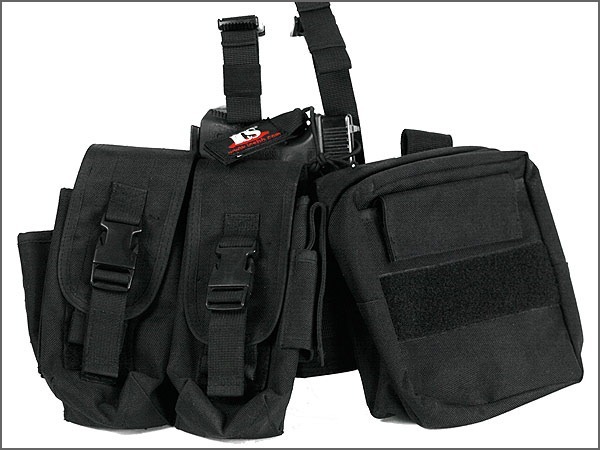 Molle/Alice fittings to add extra equipment pouches. Sadly you can only get this model in black at the moment. Tan would be a nice addition! 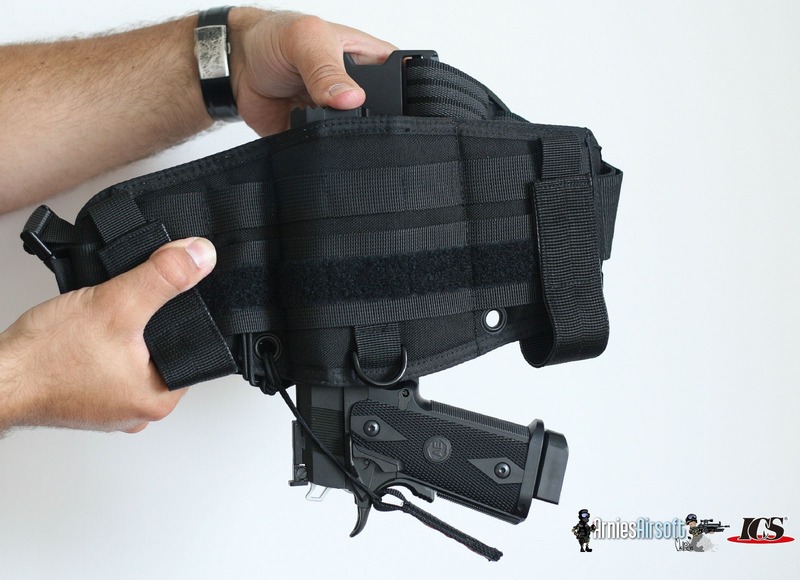 The soft shell design can mean that the hole for the pistol becomes thinner when you remove your handgun meaning it may not be as fast to re-holster the pistol afterwards. 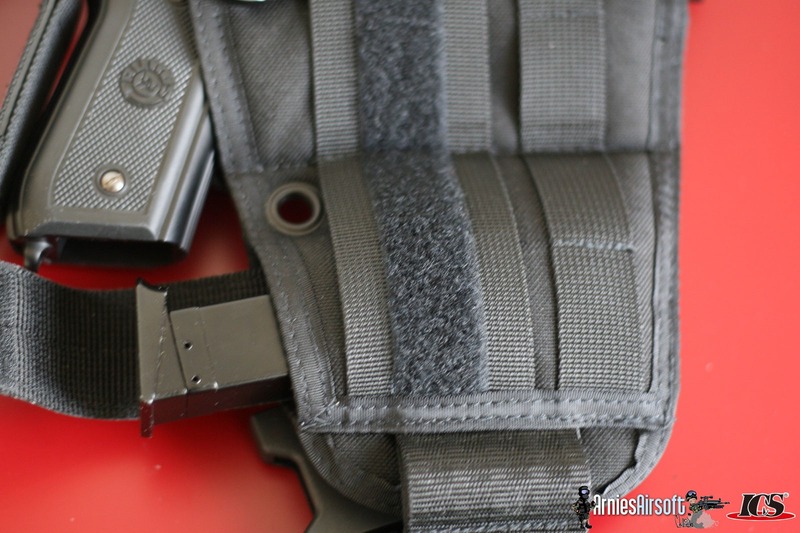 Mounting more Molle pouches onto the holster whilst a useful idea can tend to clog up the holster reducing functionality. Conclusion: In conclusion a decent value holster that should last and survive more than a few pistols and changes of hardware and setup.